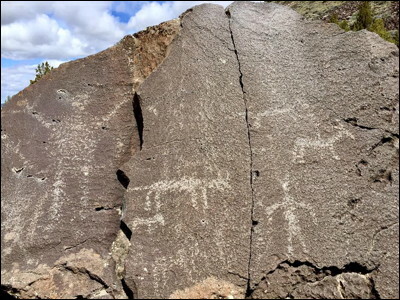 Each time I saunter through this area of eastern Oregon, I stop in at Picture Rock Pass and visit this storytelling scene. A number of years ago, I also visited rock writings on the back side of this ridge, and despite several times revisiting the area, I could could never find them again -- until May of 2017. I am particularly drawn to the dragonfly image that shows the two potholes (dry lake beds most of the year) below the ridge, and celebrates dragonflies, which are here is mass during the spring and early summer when the potholes have water and there are marshes on their edges. Here is more about the storytelling scene: Storytelling.